Wailea Marriott Luau - Maui Hawaii Luau - Book Your Tickets Today! Book The Marriott Wailea Luau Now! The Wailea Marriott Luau welcomes you with a fresh flower lei and a warm smile. A constant among the vast generations of Hawaiians and Polynesians is the ocean tide. 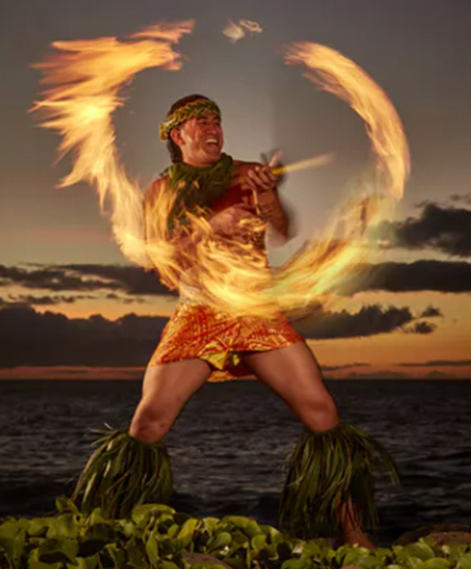 The tide linking all of Oceania, Wailea Marriott Luau -Te Au Moana-, shares the ancestral telling’s of the people of Maui and the Pacific through lavish songs and dances; songs and dances that celebrate their intrinsic skills. Fishing, gathering, gift giving, romance, tapa making (bark cloth) were vital aspects of daily Polynesian life. 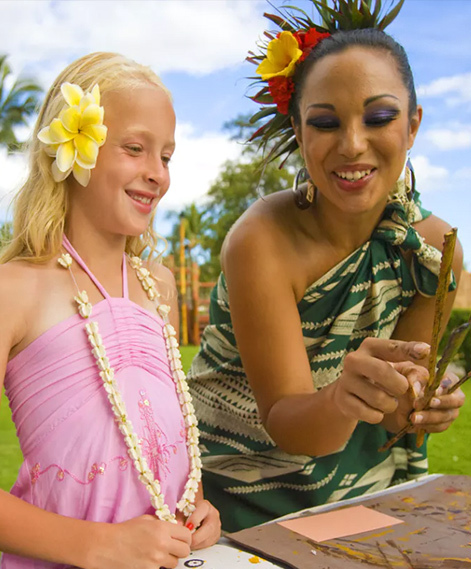 The Wailea Marriott Luau – Te Au Moana – celebrates these natural relationships among the Polynesians, and invites you to enjoy an extraordinary Luau experience like no other. Flower Craft: It is common throughout Polynesia to find great gatherings of people weaving indigenous foliage and flowers into elaborate arrangements. Guests will share in this pastime by creating their own floral piece; and learn of the significance of the lei and experience its timeless appeal. Kapa: Otherwise tapa or bark cloth can be found throughout all of Polynesia. To Hawaiians it is a hana no’eau or skilled art that survived extinction and is being constantly revived. Casual Hula’s and Story Telling: Hula to share with guests who wish to remain seated and enjoy the ambiance. Hawaiian Artisans: Maui’s own Kapu family will provide a Hawaiian exhibit and offer deep insight into the multitude of Hawaiian Weapons, epic voyages, and royal lineages of Maui. Imu: The remarkable underground oven cooking of a whole pig using the same tools and methods of the ancients. Following our Kupuna’s (ancestors) method of storytelling, Te Au Moana comes to life in a storytelling format. A retelling of the legendary episodes of Maui as he lifted the heavens from the earth so that man could walk tall, slowing the sun so that his mother Hina could dry her kapa, retrieving ava from the gods so that man could partake, and the fishing up of the islands from the sea. Features dances from Tahiti, Tonga, and the Atolls of Cook Island to demonstrate the inherent relationship among all of Oceania. Celebrates the island of Maui with contemporary songs and hula, including ukulele players, a vibrant torch dance, and the dangerous fire knife dance of Samoa. Be sure to learn all about the Hawaii Luau History before you attend! I loved the luau it was my first time here in the maui island and you guys were great. Food was also fantastic I loved the teriyaki steak. Really loved the host very informative about the history of the culture. Very lovely. The dancers and the story line were great. This is my second time and it was still great. Nice ocean background, food was healthy and delicious, the Mistress of Ceremonies was absolutely excellent, beautiful dancers and good music by the band. We had a very good time.